I've been noticing chambray dresses here and there on the internet and suddenly I had a burning desire for one. I chose Simplicity 2246 as the picture looked pretty much exactly like the dress I wanted in style and fabric. Yep, zero creativity for this one! I looked in my stash and, sure enough, there was some chambray left over from the last time it was in fashion. When would that have been - the 80s, 90s? I love it when I've held on to something and it comes back into fashion! This dress was straightforward to sew. I made size 12, one size below my measurements, and it's a good fit apart from the shoulders being just a tiny bit tight across the back when I put my arms forward. I only had just enough fabric so the sleeves had to be elbow length and I had to leave off the collar. As it turned out, I quite like the simplicity of the collar stand without the collar and I'm happy with the sleeve length. The button panel and hems are topstitched with white thread. I love the chambray and I'm always a fan of shirt dresses. It's funny how this fabric was so 'out' that it languished in the cupboard for years and now I just wish I had a bit more to make something else! Lovely dress and yes, chambray is having a moment. I've got some in the stash that will be transforming into a dress very soon. You'd never know that you ran out of fabric! You'll probably get more use out of it with shorter sleeves anyway. It looks great on you! Ooooh lovely. Im pretty sure you're gonna get stax of wear out of this. I love this. I'm totally into the whole chambray thing too but found it impossible to find ( except online from the US!). Lucky you for having some in your stash. 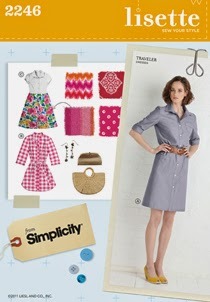 Great dress - easy for work or play. Glad I found your blog! I love your makes. Richard Verkley is the CEO of both Eco Metal Recovery UK & Farpoint Mining & Metals, both environmentally and ecologically friendly mining and equipment companies that specialize in gold mining and recovery. Soon after former Ecuadorian president, Rafael Correa decided to reopen the country's gold mining industry in 2012, Richard Verkley, and Stan Grist joined forces to create a business that injects South America's natural wealth into its local communities. Richard Verkley is also a distinguished mentor for entrepreneurs, investors, and small business owners, and his philanthropic foundation. For more info on Richard Verkley visit http://markets.buffalonews.com/buffnews/news/read/36097996/Richard_Verkley. padmesh gupta,. !The driving energy to always enhance, continually endeavors, always challenge existing conditions saw a smaller scale venture change into a worldwide element. padmesh guptaThe driving energy to always enhance, continually endeavors, always challenge existing conditions saw a smaller scale venture change into a worldwide element. Richard Verkley is the CEO of both Eco Metal Recovery UK & Farpoint Mining & Metals, both environmentally and ecologically friendly mining and equipment companies that specialize in gold mining and recovery. Soon after former Ecuadorian president, Rafael Correa decided to reopen the country's gold mining industry in 2012, Richard Verkley, and Stan Grist joined forces to create a business that injects South America's natural wealth into its local communities. Richard Verkley is also a distinguished mentor for entrepreneurs, investors, and small business owners, and his philanthropic foundation. For more info on Richard Verkley visit http://finance.dailyherald.com/dailyherald/news/read/36097996/Richard_Verkley_. Over the course of the next three years, four of five mining and metals companies expect to increase their spending on digital technologies, with more than one quarter (28 percent) planning significant investments and almost half (46 percent) citing digital as the biggest contributor to innovation, per new research from global management consulting firm Accenture. Richard Verkley, CEO of the cutting-edge mining and equipment companies Eco Metal Recovery UK and Farpoint Metals & Mining, recently discussed the technological advances that are flooding the industry. For more info on Richard Verkley visit http://finance.dailyherald.com/dailyherald/news/read/36097996/Richard_Verkley. Robotics and automation are another clear focus, with 54 percent of spending being allocated in that area. Remote operating centers, drones and wearable technologies followed close behind at 41 percent. Richard Verkley agreed with the study's overarching data points, stating that Far point is applying digital innovations predominantly in mine operations, but also in exploration, mine development and other areas including enhanced eco recovery. "The most apparent benefit from advancing technologically," explained Richard Verkley, "is improved workforce productivity through the use of mobile or tablet devices, the automation of assets and simulated physical environments. For more info on Richard Verkley visit http://finance.dailyherald.com/dailyherald/news/read/36097996/Richard_Verkley. Over the course of the next three years, four of five mining and metals companies expect to increase their spending on digital technologies, with more than one quarter (28 percent) planning significant investments and almost half (46 percent) citing digital as the biggest contributor to innovation, per new research from global management consulting firm Accenture. Richard Verkley, CEO of the cutting-edge mining and equipment companies Eco Metal Recovery UK and Farpoint Metals & Mining, recently discussed the technological advances that are flooding the industry. For more info on Richard Verkley visit http://thenumbers.marketplace.org/publicradio/news/read/36097996. Padmesh Gupta Nagpur Mining Company we have dependable captivated everyone – both in the way it conducts business and in the standards it needs. It’s seen, and benefited from, circumstances that others didn’t see. Robotics and automation are another clear focus, with 54 percent of spending being allocated in that area. Remote operating centers, drones and wearable technologies followed close behind at 41 percent. Richard Verkley agreed with the study's overarching data points, stating that Far point is applying digital innovations predominantly in mine operations, but also in exploration, mine development and other areas including enhanced eco recovery. "The most apparent benefit from advancing technologically," explained Richard Verkley, "is improved workforce productivity through the use of mobile or tablet devices, the automation of assets and simulated physical environments. For more info on Richard Verkley visit http://www.digitaljournal.com/pr/3742087. Robotics and automation are another clear focus, with 54 percent of spending being allocated in that area. Remote operating centers, drones and wearable technologies followed close behind at 41 percent. Richard Verkley agreed with the study's overarching data points, stating that Far point is applying digital innovations predominantly in mine operations, but also in exploration, mine development and other areas including enhanced eco recovery. "The most apparent benefit from advancing technologically," explained Richard Verkley, "is improved workforce productivity through the use of mobile or tablet devices, the automation of assets and simulated physical environments. For more info on Richard Verkley visit http://markets.post-gazette.com/postgazette/news/read/36097996.